Click on the score boxes for a sharper view. Just caught a CQ at the end of the Sprint and decided to look up the rules. Seems like fun. Rig: Hendricks PFR-3, Ant: 180 ft Horz Delta Loop at 30 ft. 20 M was dead. 40 was ok for a short while, then faded away. Still had fun and thanks to you folks who hang in there! The heavily used pair of 3.7 VDC, 200 mAh LiPo batteries on my ATS-3A are still hanging in there! They did well for the whole event, but that's probably due to the lowest number of contacts yet for me during a Spartan Sprint. With poor band conditions and a storm just to the north, I barely completed THREE contacts on 40M and 80M combined. Can it get any worse? I doubt it! Come on December! K3/10 @ 5W and 20M delta loop or 40M extended double Zepp. Only 1 on 20M (lost K7TQ in a deep fade) and 3 on 40M. Just got going on 80M when a t-storm developed to my NW. Radar showed it moving SE, so I pulled the plug and disconnected everything. One lightning strike taught me a lesson. At least my Monday night was better than the Texas Rangers'... Had fun. Had a blast, made my first contact with my RockMite 80, can't wait for winter! A good 1st hour on 40. Didn't hear anything on 20. After beginning of second hour, 40 was not so good so I went to 80. Got Paul, NG7Z, but that was all. See you next time around. The band was long tonight. Used my AT Sprint 3 and a 300' horizontal loop fed with open wire ladder line. Good to work a few folks I hadn't contacted before in the Sprint. Submitted my log to the ARRL's Logbook of the World. My ears still hurt from the QRN on 80 meters. FT817 @ 5w, ground mounted vertical. Was able to reduce weight this sprint with a new portable battery. 13 QSOs on 40m and 2 on 80m. Playing with computer logging and new K3. Elecraft K3 @ 5 Watts. Harry, near Cleveland, OH. No sigs heard on 20. WA8ZBT had best signal here in Centerville, OH. Rig was the old IC707 cranked back to 5w. Ant was the usual OCF 80m dp at about 40'. Got a late start - first Q not until 0124z. Either the bands were real crummy or the participation was light. Total of only 16 Q's. Never heard anyone on 20. 40 was the 'workhorse' with 13 Q's but heard very few calling there. Indeed when I first scanned the band heard no one. Did hear a few later on - pretty sure I heard Randy, K7TQ, but due to condx never made contact. 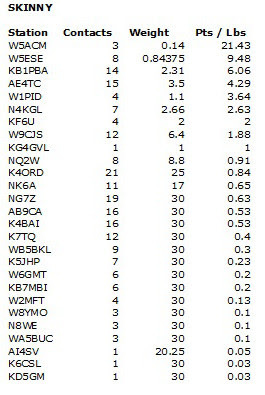 The band did seem to be long with stations in CA (2), WA (2), NY and NH coming in fairly well. 80 was very noisy with quick QSB that sucked out parts of characters, only 3 contacts there. Isn't this the time of year when 80 should be getting quiet? Despite the noise John, K4BAI, who is about 200 miles away, was armchair copy ever time I went by him. A total of about 45 minutes tonight, too many other things going on. Last Q was at 0209z. Still a fun evening. We'll hope for better condx next month. I ran the DSW-80 at 2 watts on 80 meters with an OCF dipole. Highlight was working AA1TJ in VT who was running 75mw! Later in the Sprint 80 fell off and 40 came alive in waves. 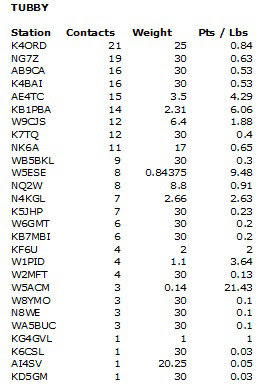 I worked 3 more stations with the K2, but didn't count them in the log because of the weight issues. Thanks to all. I was tired after CQ WW SSB over the weekend and forgot about the Spartan Sprint until the first half hour had passed. By the time I was QRV, there were no SP signals on 20 and almost none on 40. I heard, but did not work, KD2MX and K5JHP on 40 and did work QRO station WA3FAE. No answers to CQs on that band. So, the rest of the time was on 80M, where I found only 15 stations to work. Band was in pretty good shape with four stations from TX, one each from IL, WV, and PA and the rest from the fourth call area. Hope for more activity next month. Look for me (with KU8E, K9YC, and N3ZZ) to be QRV from the new DXCC entity of Bonaire Nov 23-30 using PJ4/home calls and in the CQ WW CW contest using PJ4A. Using my Ten Tec 1340 to an inverted vee at 40 ft. Seemed like quite a bit of activity at first - heard W7OM but couldn't work him - hoped to hear him later but didn't. Some stations answered my CQ - some I was able to work - some I couldn't pick out of the QRN - hopefully, we'll connect in future events. Thanks to all the participants and thanks to the organizers. I'm looking forward to next month. Ten Tec Paragon II, 5w, GAP Titan vertical and managed contacts on 80,40,20,15 and 10m. Heard many East Coast stations coming in strong but unable to work them. My first Spartan Sprint. Had fun with FT817 and delta loop. This time I got my weight down by 0.64 lbs by using AAAs and ear buds. On 40 I worked MD, NY, VA, OH and MA. MA was the furthest for 1,160 mi or 580 mi per watt. On 80 I worked 2 X GA and the furthest was 261 miles for 261 mi per watt. The rig was the Sierra with 2 watts on 40 and 1 watt on 80 and a 135 foot doublet antenna. Lots of QRP fun! Where was everyone? Must have been tough condx all around. Surprised to get anyone on 20M but raised five there. The rest were on 40M. Worked Alan, KB7MBI, all bands except 160M. Thanks Alan! He must have thought I was crazy moving him around like that. But hey, ya gotta do whatcha gotta do for qso's! I hate to say it, my XYL was keeping track of the World Series Baseball game. I heard a big whoop when Rentaria of the SF Giants hit that 3 run homer in the top of the 7th inning and that ended my attention to the radio for tonight. TNX to K2ZU up in WA for my one QSO on 40 this evening. I listened for a few minutes on 20 and it sounded dead at the start of the Sprint, so I went to 40. See you all next month. 40M seemed long, able to get WA easy but TX was hard, could not get 2 stations in TX to hear me. There was very little qrn on 40 & 80. made 6 qso's on 40M and 15 on 80M. Rig K2@5W, ant's were 40M & 80M dipoles. Thanks for all the qso's. I had a good time working the 40 meter band and was surprised that I actually made a contact on the B&W-65, running 5 watts out. Noise on bands was unbelievable. Almost no signals heard. Could copy some stations for a partial transmission then they would fade out. Sorry to those stations that I couldn't copy enough to qso. Maybe next month.